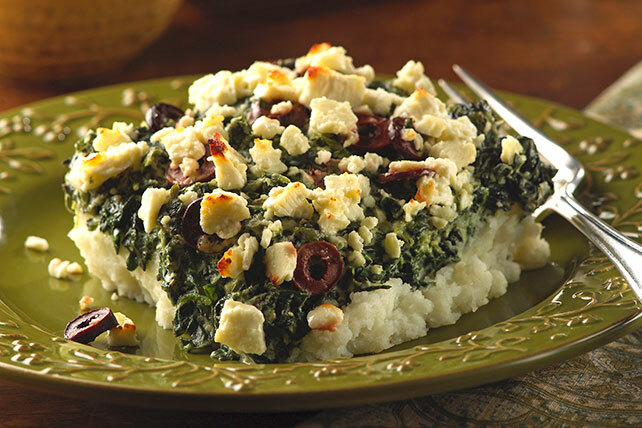 Make this Greek-Style Potato-Spinach Casserole to create a new family fave. This potato-spinach casserole is topped with feta cheese and Kalamata olives. Meanwhile, mix cream cheese, yogurt, egg and lemon juice in medium bowl until blended. Add spinach, olives and Greek seasoning; mix well. Place potatoes in medium bowl. Add butter, milk and pepper; mash until ingredients are well blended and potatoes are mashed to desired consistency. Spread onto bottom of 9-inch square pan sprayed with cooking spray; cover with cream cheese mixture. Top with feta. When recipes call for thawed spinach to be "well drained," this means the excess liquid must be pressed or squeezed out. Use clean hands to squeeze out portions of the spinach, or place the spinach in a sieve and press on it with the back of a large spoon.